After Entering the Park through the South Gate and making ones way past the Gallery Pavilion and Restaurants it is only a short walk up North along a pleasant walkway to the nearest Entrance Gate to the Altar of Earth itself. As with most, if not all, ancient Altars throughout the City, The Altar of Earth was surrounded by two enclosing walls. In the case of the Earth Altar however, the walls in turn were surrounded by a Moat, hence the translated name Square Moated Altar. Official bilingual and modern description to the Altar of Earth inside Ditan Park, Beijing. The Description however is of Little practical use. the Holy Throne of the Emperor enclosed within two Walls -those of the Forbidden City (Palace Museum) itself and the Wall of the "Imperial City". In turn the Imperial City itself was enclosed by the Ming Era City Walls as well the Great Wall of China. In case of the Earth Altar both enclosing Walls were set up in Squares, symbolizing the complete Earthly Nature of the Altar as well as the Goddess of Earth. The traditional line of thought behind the design is as follows: Earth is fertile and thus Female. Its opposite, the Heavens Rule and Inspire, as do the Emperors, and are thus Male. Earth is represented by a square, whereas the Heavens are represented by a circle. 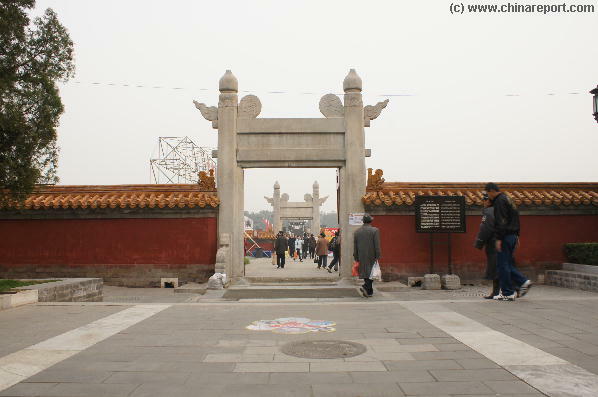 People flock in- and out of the Confucian Era White Marble Lingxing Gates of the Earth Altar complex. the Gate in the North has three instead of only one opening, clarifying its function as the Most Important of all. During the ceremonies the Emperor and the High Priests involved would enter the Altars' confines from the Northern Direction, as it were descending southward from the Heavens onto the Earth. There a few details known and published on the Ceremonies and Rituals that followed then, however at some time during the Rituals the Emperor would proceed from the Main Square Altar of Earth, southward through the Lingxing Gate to Enter the Temple of the Goddess standing adjacent and outside of the two enclosing Walls. 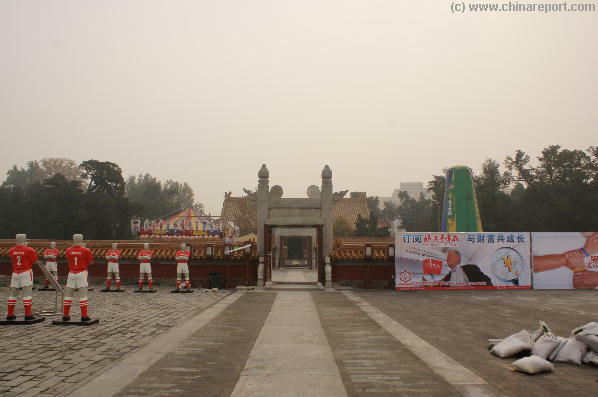 Once through the Lingxing Gates one is confronted by an expectedly large paved Square in the middle of which sits what looks like a colossal brick platform. The square measures 37.4 Hectares (92.4 acres). The Platform has two layers, both square in shape, and stone stairs lead up from each direction of the compass. View of the Altar of the Earth (Di Tan) inside its enclosing Walls at DiTan Park in Dongcheng District. Today the Altar is often used as a Stage for Sports, Social Rallies and other activities. A Maquette/Model showing the original lay out of the Altar of the Earth (Ditan) and the Line Up of Priests and Scholars during the Yearly Summer Solstice Ceremony. Minor Lingxing Gates leading North from the Altar to the Shrine Temple of the Goddess of the Earth. Have a look around from the Top of the Altar to appreciate the surrounding Park Green and skyline beyond. The skyline is clear 360 degrees around, except for some highrise buildings appearing way off to the South. Depending entirely on the Timing of your visit, the Altar and Square Space can be entirely abandoned, or really busy and full of People. As mentioned, Ditan Park and the Altar are a popular location for rallies and gatherings, so depending on what is on the Agenda, you may find yourself surprised. Views of the Altar Space in the South- and Western Directions from atop the Altar Platform (November 2007). venues for Olympic Visitors to gather and watch the Official Opening Ceremony live on Large Screen. According to the accompanying YouTube Video, the Park was packed with People, Organization was impeccable and as most now know, the Olympic Games were a Complete Success. China starred at and with the Olympic Games in 2008 and the very least, the Games helped announce a new Beijing and a new China to an interested world. You Tube Video - Gathering to view the Opening Ceremonies for the 2008 Olympics on Large Screens at Ditan Park in Beijing (8-8-2008 AD). and quiet, or the grandeur of the preserved cultural artifacts. Others only come for a Nap or some practice in "Water Calligraphy". After spending your Time at or near the Altar it is Time to move in to the other historic remnants inside the extensive Temple Park. Head out in any direction. 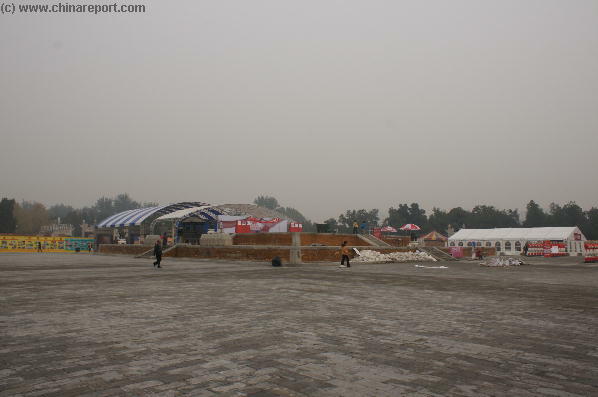 You Tube Video 2- Opening Ceremonies for the 2008 Olympics on Large Screens at Ditan Park , Beijing. 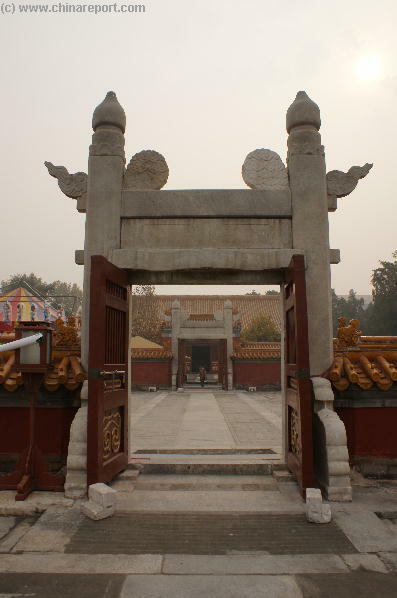 The Southern Lingxing Gates leading from the Altar of Earth to the Temple of Earth - Fangze Ting. one can head out to explore around the Park where there is plenty of space, more to see and often lots to do. 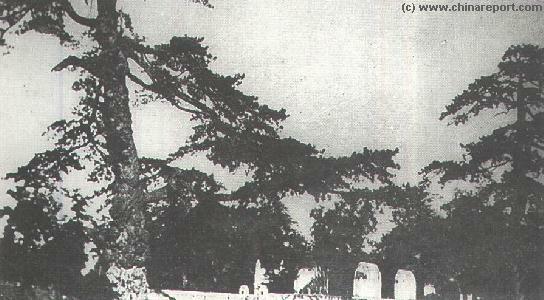 A Historic Photo of what is alledgedly the Altar of Earth (early 1900's). 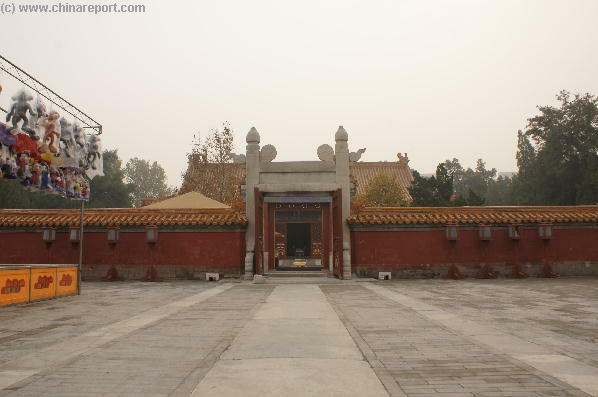 After its construction the Di Tan - Altar of Earth and surrounding Temple Complex served continuously throughout the Ming and Ching Dynasties as the main Venue in the Nation for the Sacrifices to the Goddess of the Earth. 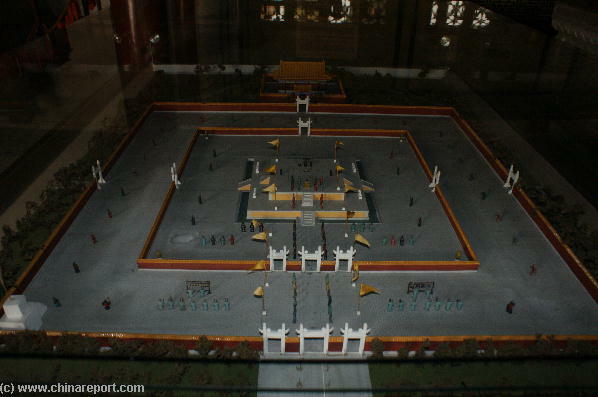 As part of their rituals to maintain the benevolence of the Heavens, Emperors of both the Ming and Qing dynasties would visit the Temple only once per year accompanied by their High Priests and Scholars in order to attend the annual summer solstice ritual for offerings to the Goddess of Earth. The Altar was operational until the Final End of the Feudal System and the Demise of the Ching Dynasty in 1911 AD. According to some sources, it was damaged in the turbulent period of the Cultural Revolution but no details have yet be found on the damage that occured. Likely, zealous red Guards tried to demolish relics of what they saw as a demonic and oudated society and its stil lingering limitations on young people. Whatever the revolutionary past, the Park, Altar and main Temple buildings have been restored fully. from the Earthly realm represented by the square Base of the Temple Park into the Heavenly Realm as represented by the circular shaped northern half of the Temple of Heaven Park. Similar symbolic's are found throughout the Imperial City and the Altars. 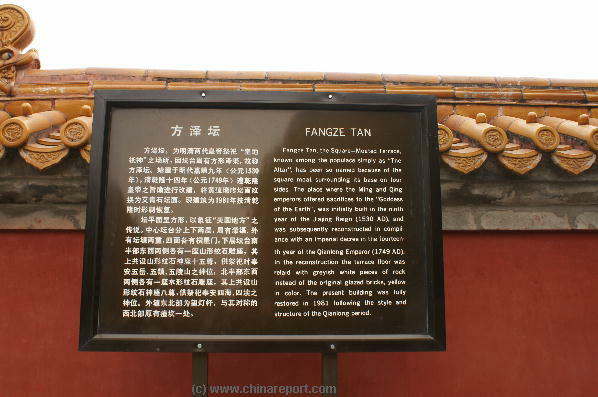 Fangze Tan translates as square water altar, but it is also know as the square moated altar depending on translation. Try Tai Chi Quan or aerobics at the Altar of the Earth and find your Feminity while re-establishing Balance in your Life ! and the lower tier is 22 square meters or 66 chi, making twice 6, one Level Higher in Earthly spirituality. At most Times of the day, nothing much more can be see or found inside. Head across the Square to inspect the Altar, and climb atop it using the stone stairs. Standing atop the Altar the square suddenly feels and looks a lot smaller. Apart from ceremonial objects of unclear nature including four peculiar stone canisters inside a rectangular stone box with according slots and some incense burners there are no worthwhile items found atop the altar. No historical guide, travel book or other source so far has revealed more details on the Feng Shui, the Altar and the Rituals. Panoramic view of an Empty Altar of the Earth.